I want to make an "I Spy" baby quilt for a friend, who already has a 3 year old. I think it will be fun for the 2 little boys to play "I Spy" with each other, and for the older boy to "teach" the younger one the names of things. My question is this: how in the world do you accumulate enough fabric to complete such a quilt?? Since I want a lot of variety, I'll need a lot of interesting fabrics to "fussy cut" the objects. I haven't been able to find charm packs with novelty items in them, and it would cost too much to buy a yard of material just for one small block. [I don't have these kinds of fabric in my stash]. So if you've made an "I Spy" quilt, please tell me how you collected/found the fabric without breaking the bank! I plan to do this soon, I bought several hundred 4" squares from eBay. 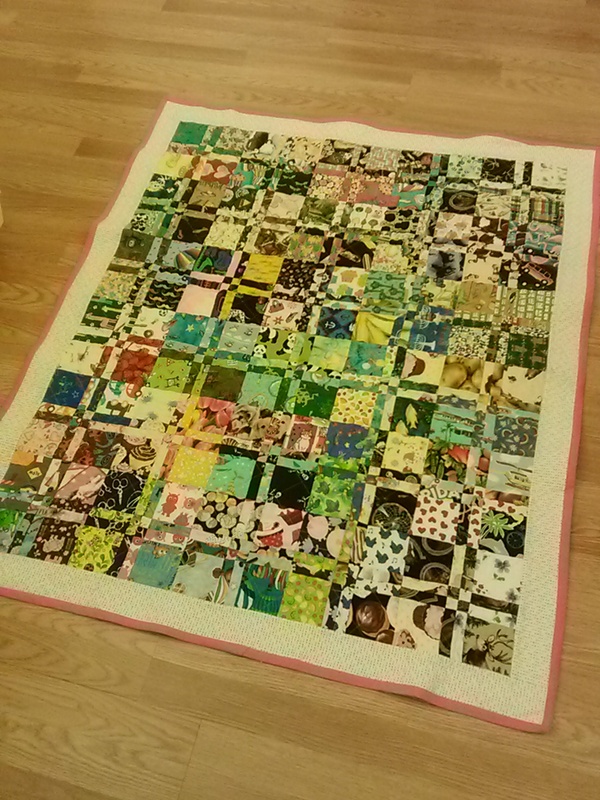 Swap or beg from your quilty friends. You can request them on this site. Just tell folks if you have a theme, like baby blue, toys, trucks, bugs, candy, space, miscellaneous, etc. Tell us what size squares to send and if you would like more than one of each square or all different. There are layer cakes of I spy fabric. I've purchased them from Missouri Star Quilt Co. I'm sure they are available other places, too. My LQS will also sell fabric in as small a strip as I want to buy. I've bought some I spy stuff that way, too. When you get several purchased and cut you should have extra squares of some. Take your extra squares and try to trade them with someone. Someone like me would be a good idea. I love I spy fabric! I'm working on one now and I participated in a swap. That helps tremendously! Fat Quarters or Fat Eighths would be a lower cost than full on yardages. Also, watch for fabrics with multi possibilities in the one piece. For example, I was FC squares last night for a different project ... from one farm animal print I was able to get 6 different farm animals, and there were four other smaller farm items (tractor, corn, milk cans, hay) that I did not use. I bought some from Etsy. I typed I Spy in their search and found people selling them. What are you looking for; anything in particular? What size squares? I'm sure I got some you can use! I think Marcia D is the QUEEN of I Spy quilts! I host the 6" fabric square swaps with different themes. The current one is posted http://www.quiltingboard.com/member-...p-t224956.html if you are interested. I have accumulated a TON of I-Spy fabs from my swap. 1/2 yard of fabric, cut 12 squares and that's it. Also I have seen a lot on Ebay for sale. I also watch the clearance section and the "mistake" cut section for squares. Wow! I'm overwhelmed by the response: so many options that I hadn't thought of! I like the idea of swapping, so expect to hear from me again! (BTW: my only quilty friends are all of you: haven't found a 'real-time' quilt friend in my area yet). Same boat!!! No "real life" quilty friends except the ones I met on here. I have met up with a couple when I've headed to Dallas for the weekend, but none in my area. Yep, just post on here what you are looking for and what size. I am sure a few of us will be happy to help you out!! Or PM me with what you need , I will send you something . I make 100's of kids quilts. The "Member Swaps and Round Robins" section of this board often has an I Spy swap going on. I've participated in two and have 180 5" squares as a result. Don't know when the next one will be but probably soon. You might pm Owlvamp because she has hosted the two I know of. I do several I spy swaps on the board - you swap sets of 20 squares on owlvamp's 5" square swap, so you need about 1/2 a yard per set - so you if you swap the max, which is 6 sets, you get 120 different squares back! Next swap is in September. These are all great ideas. You never know on e-bay if the squares are fancy-cut or not but you might try 'Quilting fabrics I Spy' in the topic line. It never hurts to look. I bought remnants for years before I had enough novelty prints to make two I Spy quilts for gifts. If you do buy fabrics, make up a template with a window of it for the finished size you want. Not all designs/prints cut up well in a given size. www.keepsakequilting.com has charm packs of kid friendly fabrics.